Batadrava: The great Vaishnavite saint and social reformer, Srimanta Sankardev’s 450th death anniversary was observed on Tuesday at his birth place Batadrava with spiritual and religious zeal. From morning onwards, thousands of devotees and pilgrims performed Guru Vandana and naam prasanga at the Kirtan ghar premises of Batadrava Than. Devotees gathered at Batadrava Than, offered prayers, took part in naam prasanga and recalled the great 15th century Vaishnavite saint on his death anniversary. The two-day programme formally began with ‘Ghosha Kirtan’ on Monday afternoon. The second day’s programme began with taal kubua, followed by Usha Kirtan and naam prasanga. Various Xattriya cultural sessions, including performance of ankiya bhaonas written by Sankardev, were held in the evening. JOYSAGAR: Srimanta Sankardev’s death anniversary was observed in Sivasagar too along with the rest of the State. 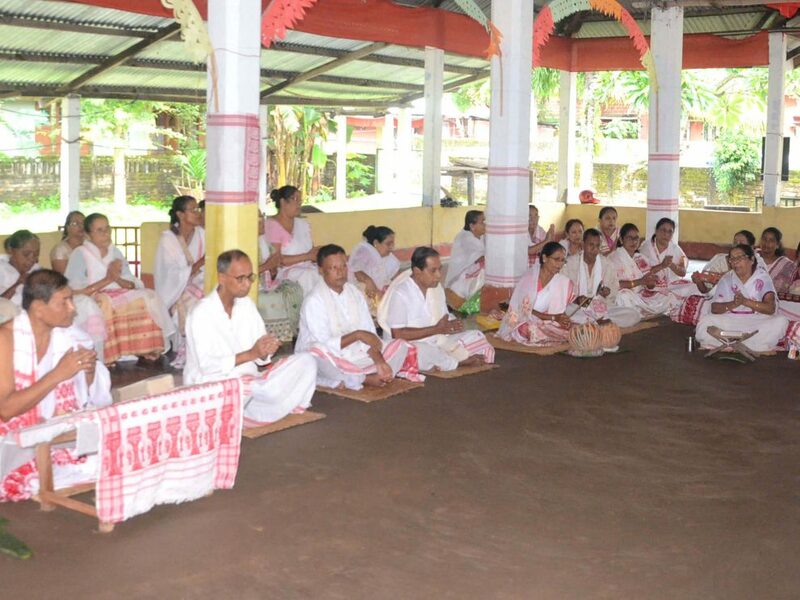 The central function was organized in the Sivasagar Srimanta Sankardeva Sangha Bor Naamghar by the Srimanta Shankardeva Samaj. Pratah stuti and pratah prasanga were held in the morning and the Usha Jatri Dol marched throughout the main streets of the town. Naam prasanga was also held. Besides, essay writing and speech competitions were also held in the naamghar premises. In the evening, Ankiya Bhaona Doikhya Jyogya was staged where the Boishnava bhakats of the Sri Sri Kamalabari Xatra took part. Sankardev’s tithi was also observed in Gohaingaon Bor Naamghar, Melachok Namghar, Dihing Than, in Mateka Naamghar and in the Doikolongia Bor Naamghar of the town. Despite bad weather and continuous rainfall, devotees thronged the naamghars to offer prayers. JORHAT: Sankardeva Tithi was observed all throughout the district of Jorhat with great pomp and gaiety. People of all age groups took part in the procession which was led by elephants. After the procession, devotees attended special prayers session followed by an open session held at the Jorhat district zilla naamgarh. Prabin Kalita, the president of the organizing committee, presided over the open session where the contributions of the great social reformer were discussed.